Pages: 105 Dimensions: 8.5" x 11" x .5" Weight: 1 lbs. A National Model for Critical Thinking Staff Development - An Urban, Conservative, Multi-Racial, Success Story. Some would say that the city of Greensboro, North Carolina is an unlikely site for a national model for critical thinking staff development. A medium-sized city nestled in the rolling hills of the Piedmont, near the Appalachian Mountains. 1400 classroom teachers. 21,000 students. A conservative Southern community. Tight budget. Multi-racial (both students and staff). Yet there it is. See how a district has been developing a first-rate, long-term critical thinking program. 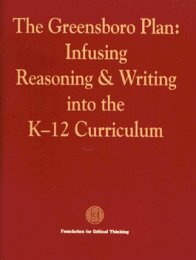 405B The Greensboro Plan: A K-12 Staff Development Model $9.99	 Qty.